Easiest Automatic Needle Threaders, Effortless Looper Threading with the Power of Air, 2-3-4 Thread Overlock and Seams, Shorter 10 vs 15mm Needle to Knife Distance for Turning Corners and Easy Curve Sewing, Larger 1.5mm Diameter Thread Ports for up to Size 12 Decorative Threads, Longer Knife Cutting Blade Edge for Cleaner Cuts, Differential Feed, Built In Rolled Hem, Bright LED Light, Up to 1500SPM Stitches Per Minute Speeds, DVD, Weighs 20 Pounds. Threads it's own loopers. *Synchrony 12 Months No Interest Financing at $108.33/12Mo Equal Monthly Pay plus any applicable taxes. Apply online. Synchrony will advise your maximum amount or full credit that you can use towards purchase. The Juki MO-1000 Overlock Serger with Air Looper Threading System is the newest top of the line serger from Juki. 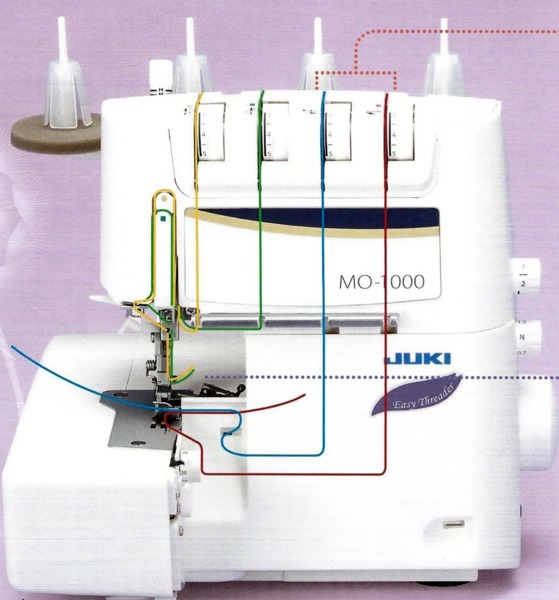 The Juki MO-1000 Overlock Serger with Air Looper Threading System features a push button threading system that blows a strong jet of air pushing the threads thru the loopers. 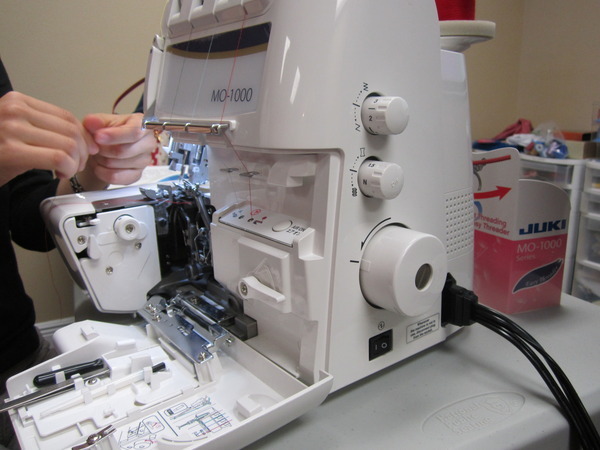 The Juki MO-1000 Overlock Serger with Air Looper Threading System is the easiest serger to thread on the market. 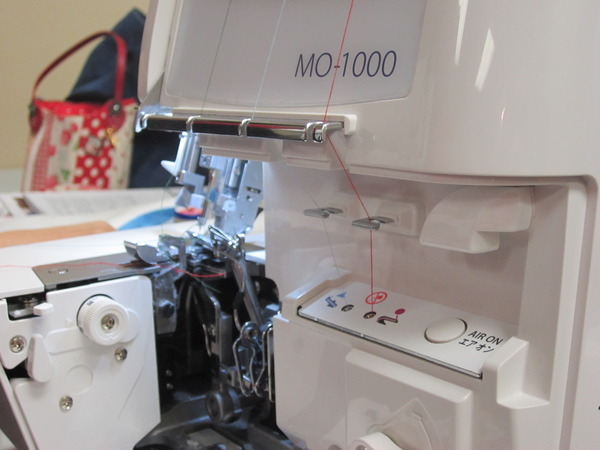 "I wouldn't rate any serger highly if it couldn't also sew and cut smoothly through thick layers of fabric, and the Juki MO-1000 does not disappoint. The knife blade is longer than most other sergers, which helps it cut anything I want to give it - like the bound edges on this stretch velour leotard. 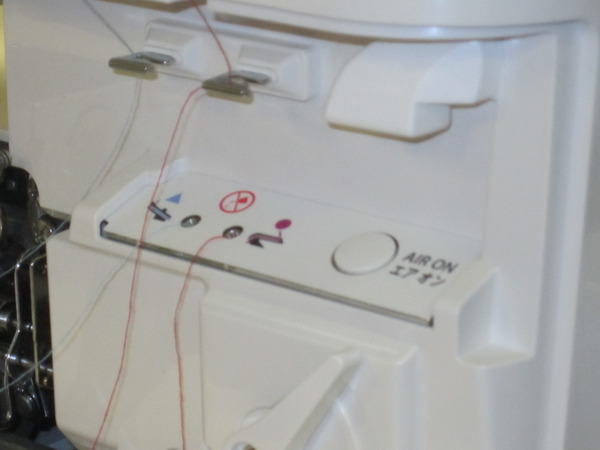 The knife and needles are closer together than other sergers too, which makes going around curves easy...Customer service has been superb, and I feel secure knowing I have an extended 10 year warranty that came standard." Do you want a quality serger, that is also easy to thread? Look no further. The Juki MO-1000 achieves the superior quality of Juki professional sergers, with the effortless threading achieved my it's air supported threading feature. Serge like a pro with ease. Featuring automatic, one touch, upper and lower looper threading, driven by an electric motor, at the press of a button. Juki did not stop there though! The redesigned knife system and sewing area allow for easier material handling and better capability for sewing sharp curves. Automatic needle threaders, differential feed, lay in tensions, and LED lighting complete this awesome addition to our serger lineup. Step 1: Insert 1-2 cm of thread into the threading hole. Adjustable Differential Feed; Adjust from 0.7-2.0 ratio for stretchy fabrics. Create Beautiful Sharp Curves: The Juki Mo-1000 features a smaller distance tween the needle and the knife, allowing you to hug corners with ease. It offers 9.95mm, where standard machines only offer 15.5mm distance between knife in front and needles in back. 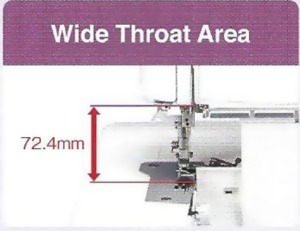 Extra high Throat Area: The Juki MO-1000 features 72.4mm height. This allows you extra space when serging and for bulky fabrics more space. 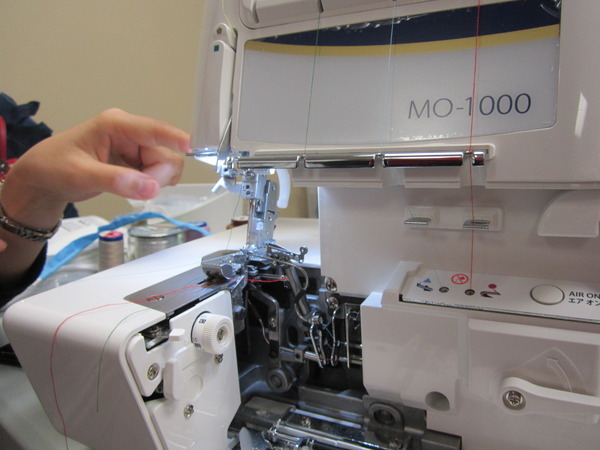 Quiet Operation: The New design of the Juki MO-1000 is designed to reduce sound, and to sew with less vibration. LED Sewing Light: Your serging area will be brightly illuminated with a Juki energy efficient, eco friendly, and long life bulb. And you're done! The machine was simply threaded by air. Uses household needles Schmetz 130/705H or Organ HAx1 15x1. You do not have to use special serger needles. Only the same needle systems and size 14 that you user for your regular sewing machine. 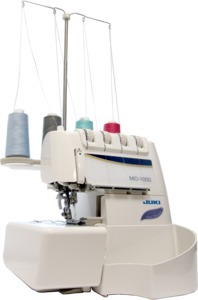 JUKI MO-1000 Air Thread Serger Promotional Video. Serge like a pro with outstanding ease with the convenient upper and lower looper air threading. Dimensions: 13" x 11" x 12.2"
Note: The standard MO-600 and MO-734 pedals will not work on this machine. Only the MO-735 Pedal is interchangable with MO1000 and will work on both machines. Automatic Needle Threader: Quickly thread your needles. High Throat Area: The Juki MO-1000 features a height of 72.4mm. New! 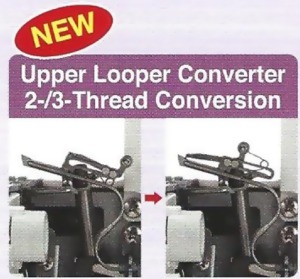 Upper Looper Converter 2/3 Thread Conversion: Allows you to switch from 2 thread to 3 thread changeover by simply pushing the attachment. 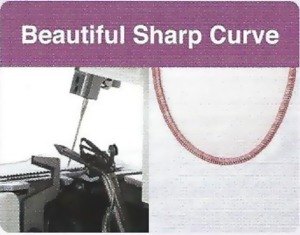 Create Beautiful Sharp Curves: This model has a smaller distance between the needle and knife of only 9.95mm. Standard models are 15.5mm. This allows you to make tighter curves. 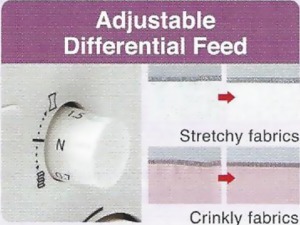 Adjustable Differential Feed: Even with easily stretched fabrics such as knits and georgette, create beautifully sewn finishes by adjusting the differential feed. 4 Thread Overlock: Uses 2 needles and 4 threads to securely sew together knitted fabrics. 3 Thread Narrow Overlock: The fabric edge is rolled then sewn with very narrow overlocking. 3 Thread Rolled Hem: The fabric edge is rolled, them covered with thread. Frill 3-Thread Rolled Hem with Differential Feed: Use the 3 thread rolled hem with differential feed on stretchy fabrics to create a wavy rolled edge. 3 Thread Overlock: This is the basic stitch for overlocking, and prevents fabric from fraying. 3 Thread Flatlock: Use this stitch as an accent on clothes, interior item, and accessories. 2 Thread Overlock: Simply sew fabric edges with 2 threads to prevent fraying.